The St. Louis Cardinals were playing the Kansas City Royals at a baseball game where the Cardinals had the bases loaded but were behind by a score of 5-4. 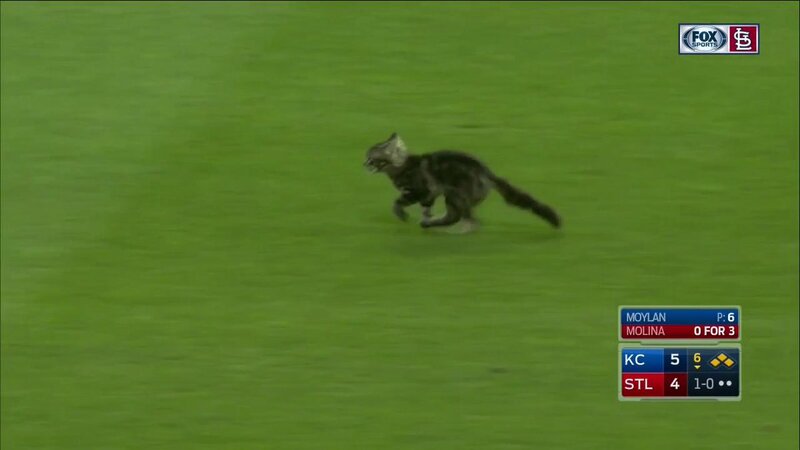 That’s when a cat suddenly ran on the field, temporarily stopping the game. After ground officials captured the cat and took it off the field, the next pitch got belted over the wall for a grand slam homer, giving the Cardinals the lead and eventually the win. Now Cardinal fans are calling this cat the Rally Cat. Hopefully the Cardinals can adopt the cat so it can continue providing good luck to the team for the rest of the season. If this works, perhaps every sports team can adopt a cat for good luck. To read about the Rally Cat that ran across a baseball field, click here.